Here comes the triumphant return of the Barbican Artistic Associates and Olivier award-winning Boy Blue Entertainment, showcasing their premiere of The Five & the Prophecy of Prana. 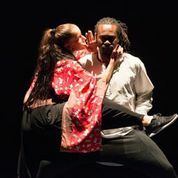 Co-commissioned by the Barbican and Derry ~ Londonderry City of Culture 2013 and co-produced by Les Théâtres de la Ville de Luxembourg and featuring a company of 13 performers, the show combines dance, hip-hop, Manga and martial arts. This time, Boy Blue’s choreographer Kenrick ‘H2O’ Sandy and composer Michael ‘Mikey J’ Asante collaborate with one of Japan’s most acclaimed Manga artists, Akio Tanaka. They’re joined by Paulette Randall, building on the partnership that began with their work on the London 2012 Olympics Opening Ceremony performance of Frankie and June say thanks Tim…. and Yeast Culture’s visually arresting video projection, special effects, animation and 3D storyboard. The result is dance and music which enlivens Tanaka’s art and it all syncs seamlessly. Jump cutting backwards and forwards over a six decade time-span, the story is told in two parts over 90 minutes with the fable describing two generations of Warrior quintets and the mythology of their world. We join the eponymous Five on a journey from delinquency and court room to Dojo, then to battle, victory, redemption and triumph. H2O and Mikey J’s original story is actually quite tough to follow if you’re looking for narrative clarity – but this shortcoming is outweighed by the breath-taking quality and drive of the dance which mixes together power, flexibility and grace. As we learn of the Five natural elements which maintain peace and harmony in the kingdom - wood, fire, earth, water and metal – contained within mysterious Orbs and embodied by animals Horse, Scorpion, Gorilla, Snake and Crane - [see what I mean about confusion] - the Five are identified by a down on his luck martial arts master as having the necessary attributes to lead the battle of good against evil. The influence Hong Kong Kung’s Fu films on Boy Blue and the features of this genre are all apparent, and to hilarious effect - melodramatic and cinematic storylines, exaggerated, overdubbed speech and hyper-violent karate style katas and kumite fight scenes. Just as important are the echoes of the Five elements of hip hop culture - break dancing, DJing, graffiti art and MCing bound together by the quest for knowledge. Visually eclectic, The Barbican’s auditorium does justice to the scope of the show. Shadows and silhouettes together with Akio Tanaka’s fantastically detailed manga artwork didn’tt overpower the parallel narrative and performance on stage. Nor do the giant mobile building blocks - deployed as props, projectors of imagery as well as mini stages. A great strength is the fusion of dance and movement styles that guide the dancers’ performance. This crew are powerful – switching pace from fast to slow in routines that are well controlled and performed. Locking, popping and slow motion dance styles are skilfully displayed and the frequent technical and stylised fight scenes are totally believable – and perfectly executed. During the show’s development stage, Mikey J and H2O worked with the globally famous Shaolin Temple Warrior Monk School. Adding to the story’s creation myth, the Shaolin Warrior’s defined hip-hop dance as an air element, complementing their own earth attribute. It’s apparent in the performers’ athleticism, fluidity and energy. The music holds it all together and it fits the story like a glove: From electronica and hip-hop to classical and Japanese Kodo style as well as to Taiko drumming, these vital elements pulse as the show’s rhythmic heartbeat. And the birdsong in background enriches the atmosphere. As Mikey J explained in the show’s programme; each musical bar has been created to fit a movement of the dance, to pair with and enhance the story like a soundtrack. With the Barbican’s fantastic acoustics it achieves that aim, and the bass line is heart-shaking. Ending the spectacular and muscular performance was an epic movie style message bearing the legend, ‘to be continued’. It should be worth waiting for. Shaun Ajamu Hutchinson is The New Black Magazine's deputy editor and a London-based freelance journalist.